Three new bags were added to the shop today made from leather apparel that was deconstructed and given a second life in my studio. These bags are actually all made from one coat I purchased at a thrift store back in New York. I enjoyed taking it apart and piecing it back together like a puzzle. For future projects I plan to experiment even more on incorporating pockets and other features already on the apparel to my bag designs. I already have plans for another two jackets that I scored today. Can't wait to get started! Just added four new Wayfarer Purses adorned with handmade bird appliques to the Pesky Cat Designs shopin nutmeg, steel gray, fuchsia rose and sage green. The Wayfarer is great size to use as an everyday bag. These purses have one interior zippered pocket and one slip pocket perfect for a cell phone or something else you want quick access to. The strap length is about 25" end to end which works for most body frames. I'm happy to be back in the studio creating and designing full time again! This week I finished up three new colorblock purses and a blue velvet messenger bag. I'll be adding them to the shop tomorrow. Today the Pesky Cat Designs team went out for a drive to the sea. Took shots of the new bags and a few others. 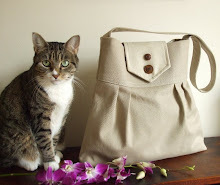 See more from today's photo shoot on the Pesky Cat Designs Facebook page posted here. All these wonderful photos were taken by TN. After spending several months on a job assignment that took me away from my studio, I'm finally back in St. Augustine, FL. I worked with a wonderful group of folks and enjoyed my stay in Tarrytown, NY which is about 40 minutes by train into NYC. I'm eager to get back to designing and creating and have lots of new ideas I can't wait to get started on. 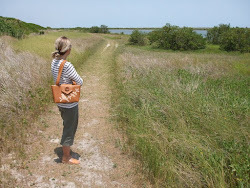 Above is a shot of Millie, a wonderful coworker back in New York, modeling the Harris Tweed Patchwork Satchel. Wish I had her here for my next photo shoot!